Oracle Promoting Microsoft Bing? Microsoft Paying Oracle and Subsidizing Java? Cats and Dogs Living Together??? Is Larry Ellison aware that Oracle (which now owns Sun and its Java products) is promoting Microsoft Bing? By the way, a colleague told me that he received a similar promotion for a Yahoo! 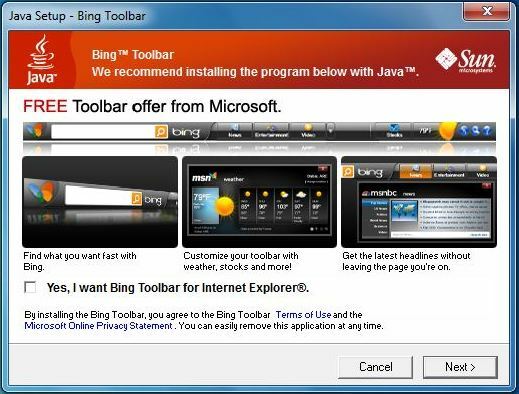 toolbar rather than the Bing toolbar, so perhaps Oracle is not solely promoting Microsoft, and perhaps this deal was done before the acquisition. Still, it’s odd that Oracle would promote a Microsoft product. It’s even odder that Microsoft is so anxious to promote Bing that it will even do so while subsidizing Java and paying Oracle, two that must be high on Microsoft’s “Most Wanted” hit list – does Steve Ballmer know that Microsoft is paying money to Oracle, and (horror of horrors!) subsidizing Java??? Yeah, I was wondering about that too. They are offering Bing toolbar and then Open Office in the same breath!